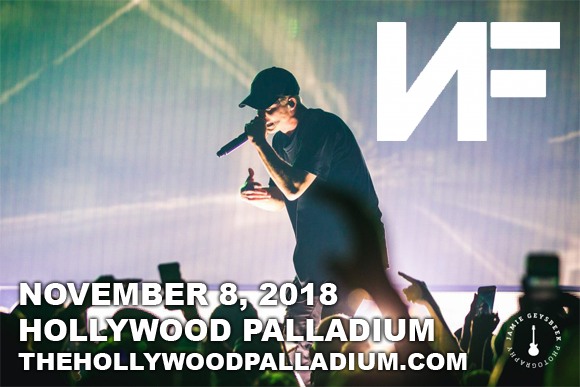 Michigan-based rapper and one of the biggest names of the current rap scene, NF brings his chart-topping hip hop to Hollywood Palladium on Thursday 8th November 2018 as part of the fall leg of his Perception Tour! Fresh from a shockingly successful summer stint alongside fellow rappers Logic and Kyle, NF's career is going from strength to strength and this solo headlining tour sees him take to the stage to promote his number-one, platinum selling album Perception! The artist may also bring some fresh new material to the stage, having heralded the announcement of his fall tour with the release of a brand new single, “Why”! Watch this space! Tickets available now! American rapper, singer and songwriter NF first began making music in 2010, releasing his debut album, Moments, that year on Xist Music under his full name, Nathan Feuerstein. After signing with Capitol CMG, he found his breakthrough four years later with the release of an EP titled NF, which marked his first release to hit the Billboard charts, reaching the Top 20 on the Christian Albums chart, the Top Gospel Albums chart and on the Top Rap Albums chart. His debut studio album, Mansion, was released the following year and reached number-one on the Christian Albums Chart. Therapy Session, his 2016 follow-up, won the 2016 Dove Award for Best Rap/Hip Hop Album of the Year. Perception, NF's third studio album, was released in 2017 and reached new heights of success for the artist, debuting at number-one on the Billboard 200, as well as hitting the top spot on the Independent Albums and Top R&B/Hip Hop Albums charts. The album also launched the single "Let You Down", which charted internationally and went triple platinum. NF is known for his cross-genre popularity, finding success within both the Christian music and hip hop scenes.